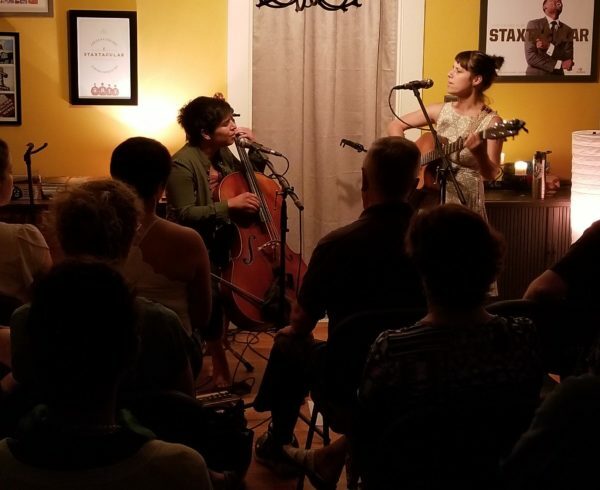 Our series has gone through a lot of changes in the past year, and since our first public show last fall, people have been asking if we’ll ever do true house concerts again. I always figured sure, sometime, but didn’t have any specific plans to go back to the house. When I realized that construction would keep us from our usual spot in May, I tried a bunch of different options before finally settling on coming home. In retrospect, it was clearly the best place to be all along. I’ve loved our bigger concert spaces and look forward to having a regular public venue again, but there is a special feeling that comes from gathering together in someone’s home. It’s the soul of the series. We share a sense of community no matter where we are, but guests definitely feel more like welcomed friends than ticketholders when sharing snacks in the kitchen or taking a seat in the dining room. There’s a little less legroom and a bit more chatting among strangers. When welcoming Tina & Her Pony for their Memphis debut, it felt just right for us to be in such a warm, open-hearted place. Quetzal Jordan and Tina Collins traveled from Asheville – by way of Milwaukee, Chicago, and Lexington – to join us at the end of a week’s long travels. With the previous night off, they got to spend Saturday exploring Memphis and settling in at a more relaxed pace. They were practically locals by the time they took the stage, and they were greeted by an audience comprised mostly of first-time guests (special shout-out to patron and series regular Hélène for being the force behind half the night’s attendance). With the obvious connection that drew them together as collaborators in every sense, Tina and Quetzal told and sang the stories of their courtship and marriage, their families and friends, their inspirations and struggles. They ranged from the ethereal to the very real, as life and love do. With our first series appearance of a cello, Quetzal could swing the tone from quiet intensity to playful whimsy depending on the need. Tina layered with ukulele and guitar to build on their foundation of poetry and grace. It was such a privilege to introduce Tina and Quetzal to Memphis, and just a true pleasure to host them in my own house. They are out there doing honest, empathic work, and that’s not a job that guarantees fame, fortune, or even a fair day’s pay. And yet they travel on, creating a little bit more humanity in the world. For that, they’ll always have a home with us.